Take a peek at this 5-Tier Counter Top Display! Constructed of durable metal materials, this wire fixture is ideal for highlighting such items as boxed candy, chocolate candy bars of various flavors and sizes plus other goodies like chewing gum, salty and crunchy snacks too. 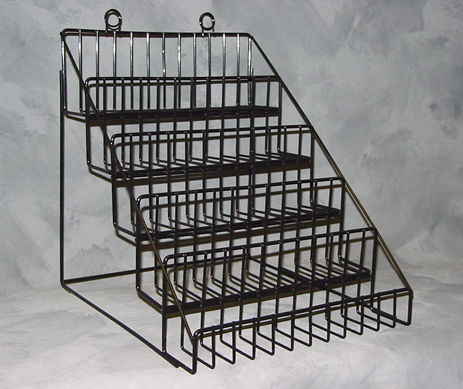 The overall measurements for this wire rack display is 12-inches wide by 14-inches high with a depth of over 14-inches. Each tier is three-inches deep and comes with a two-inch front lip to help keep your materials safe and secure. 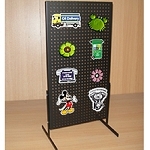 The display rack comes with color options so you can pick which best fits in your facility. 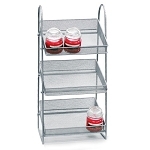 This metal counter rack is a great way to tempt your shoppers into one last sale just before they exit your business. Strategically place this wire counter fixture at your checkout lines or service counters in full view of all who purchase products. 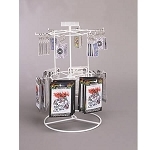 Purchasing this retail display rack is easy, just click and add to your online shopping cart today!